Go for the rich chocolate flavor that tastes more like a milkshake than a healthy, dairy-free, protein-rich meal replacement! Then, you'd love our emails. Sign up and receive an exclusive MCT Lean recipe book and a discount code for 15% off your next order! MCTs—increase metabolic activity and promote burning of long-chain fatty acids (LCFAs) stored as body fat. SGS™ broccoli seed extract—a super-vegetable with the highest level of glucoraphanin, which is extremely high in antioxidants that enhance cell detoxification. Aminogen®—a patented, natural, plant-derived enzyme system clinically proven to increase protein digestion and amino acid absorption, which aids in the synthesis of muscle mass, and promotes deep muscle recovery. What’s in MCT Lean Vegan Protein Blend? 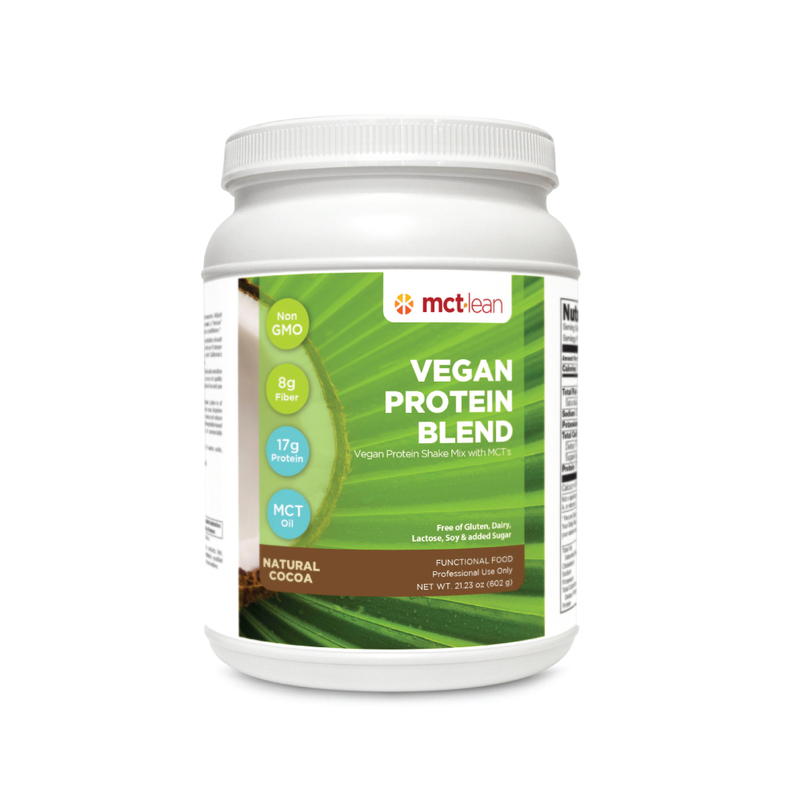 How does MCT Lean Vegan Protein Blend taste? Do I have to be a vegetarian or vegan to use MCT Lean Vegan Protein Blend? How should I use MCT Lean Vegan Protein Blend? Can I supplement MCT Lean Protein Blend with other products? Why does it seem like there are fewer than 14 servings in my canister? Vegan Protein Blend is MCT Lean’s proprietary blend of pea protein isolate and rice protein concentrate, L-glutamine, glycine, and taurine. MCT Lean Vegan Protein Blend also contains SGS™ Broccoli Seed Extract, Aminogen®, medium chain triglycerides (MCTs), and inulin from non-GMO chicory. Delicious! Whether you prefer vanilla or cocoa flavor, we guarantee MCT Lean Vegan Protein Blend will taste better than any other plant-based protein powder you’ve ever had before. While all ingredients in MCT Lean Vegan Protein Blend are 100% plant-based, you don’t have to be vegetarian or vegan to enjoy the benefits. The pea protein isolate/rice protein concentrate mixture has an amino acid profile similar to whey protein—suggesting that MCT Lean Vegan Protein Blend is suitable for vegetarians/vegans and omnivores alike. MCT Lean Vegan Protein Blend is a delicious, simple way for meat-eaters to include more plant-based nutrition in their diets. Mix MCT Lean Vegan Protein Blend with fruits, vegetables, nut butters, yogurt, water, or unsweetened plant-based milk alternatives, etc., to enjoy as a meal replacement, pre-workout energy smoothie, or post-workout recovery smoothie. MCT Lean Vegan Protein Blend can also be enjoyed as a healthy snack alternative or “rescue food” by mixing 2 scoops in 8-12 oz. of cold water or unsweetened milk alternative. Definitely! MCT Lean Vegan Protein Blend is a great addition to any regimen and does not interfere with other supplements. MCT Lean Vegan Protein Blend goes great with MCT Lean MCT Oil—it’s the perfect pair! Each canister is measured by weight rather than volume. Gently shake the canister prior to opening each day then gently scoop the powder out, this will ensure 28 scoops per bottle (14 servings).